Measure the performance of your LinkedIn ads. You can also pick a metric, like Clicks, Impressions, or Average CPC, and have LinkedIn create a line graph showing the data as far back as the most recent day, week, or month of the campaign, or the life of the campaign. LinkedIn also provides a Click Demographics screen that aggregates the data for each person who clicked on your ad in terms of his job function, industry, title, seniority, and other factors. This way, you can see if your ad is appealing to a specific demographic. This data is especially useful if and when you decide to revise your campaign. At any time, you can go back and edit your existing ad campaign, changing everything from the ad elements (the image and text of your ad), to the audience (the targeting filters you defined), to the bid amount and budget for your ad. Once you save your changes, LinkedIn will update your ad campaign with the newest choices you made. Drop the worst performing variations. If you created multiple variations of your ad, go back and delete or disable the ones providing the lowest click-through rates. This will raise the effectiveness of your overall campaign and increase the impressions as LinkedIn will be more motivated to serve up a higher-performing campaign so it earns more money for that advertising slot. Change your destination URL. The problem may not be with your ad, but with the conversion page the potential customer reaches after clicking your ad. If you use analytic software on your own website, you can see if people are leaving your destination URL after arriving from LinkedIn without acting on your call for action. Consider using a face as your ad image. Other advertisers have mentioned that the best-performing ads they’ve experienced were ads that used a picture of someone’s face as opposed to a logo or product image. Since you are limited to a 50 pixels-by- 50 pixels image, you cannot use a complex or text-laden image. You can best connect to your audience with a visual image that’s inviting and personal, like someone’s face. Ask for the click. While you are limited to only 75 characters, you should specify for readers to click the link, not just describe what you are offering. As a bare minimum, give readers a good idea of what they are receiving and/or how your offer can improve their life with a tangible benefit. Test out new content. Once you have been running a campaign for a while, try out new content in your ad. It’ll catch the attention of people who have already acted or dismissed your previous ad and raise interest and interaction. If you run a Sponsored Update, pay attention to the comments it receives. If you want your Sponsored Update to perform better, be sure to Like the update yourself, have your employees engage with the update, and answer any comments from customers that the update may be receiving. That interaction and involvement will raise the update’s visibility and hopefully gain you further engagement and a positive brand image. 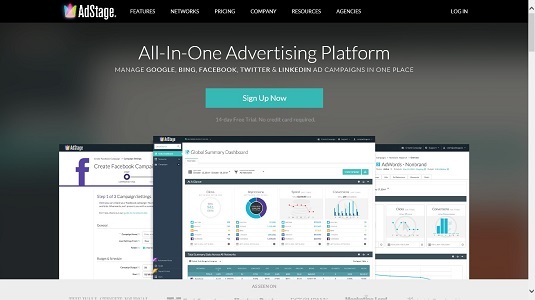 As you progress with your LinkedIn ad campaigns, you can also utilize tools like AdStage’s All in One Advertising platform to help you with all your online ad campaigns. Go to AdStage’s Home page for more information. 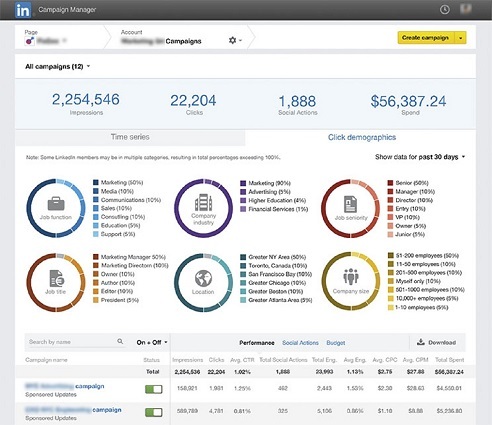 You can use advanced tools like AdStage to help manage your ads.